Three Elgin Academy mental health champions Josh Hanover, 13, George Lunn 14 and Robyn Lean, 14. Teenage mental health ambassadors will help promote the need for better mental wellbeing as part of an innovative new campaign launched in Moray. All eight secondary schools in the region are taking part in the scheme organised by Moray School librarians with the aim of helping young people deal with stress and anxiety. Each school will recruit 30 mental health champions from S3 who will be trained by health experts and then use those skills to become an advocate for mental wellbeing. 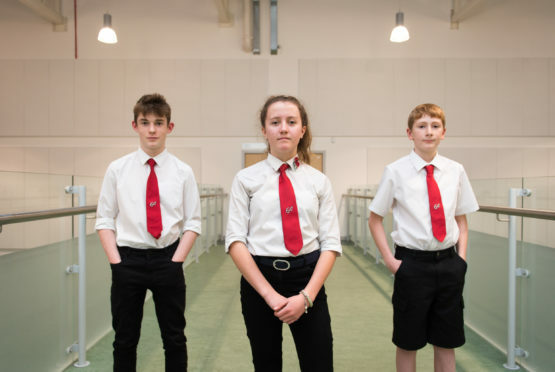 They will then decide how best to promote the subject to their peers and parents, which could involve holding parents evening events, assemblies or through other activities. The final aim of the ambassadors is creating a teenage flourish area in each school, where all children can go to for resources if they are struggling with their mental health. A big event in March will be held with author Nicola Morgan holding a keynote speech. The Moray school librarians received a grant of £7,500 from the Scottish Government through their School Library Improvement Fund (SLIF)to work with partners in the region to promote mental wellbeing for Moray’s young people. Elgin Academy librarian Shelagh Toonen believes the idea of teenagers helping their peers with their health will encourage them to open up more. She said: “These young people are going to be advocates, working out strategies and resources and raising awareness of anxiety mainly and stresses to do with friendships in their peer groups and how they can be helped with that and where they can go to get help. One of the Elgin Academy young champions Josh Hanover, 13, got involved in the scheme because a few of his friends suffered from mental health issues. He said: “I just wanted to help people, cause I’ve had quite a few friends who have needed help and I just wanted to help other people.